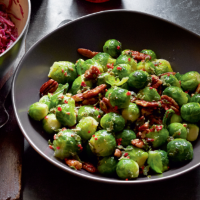 Give your Brussels sprouts a make-over this Christmas with this delicious vegetarian recipe. Cooks the Brussels sprouts in boiling water for 8-10 minutes or until just tender. Drain and return to the pan. Meanwhile, dry-fry the pecans for 1-2 minutes until golden. Set aside. Mix together the butter, chilli, sage, lemon zest and juice. Season well. Stir into the hot sprouts with the toasted pecans. A day before, trim the sprouts and make the flavoured butters. Keep separately in the fridge. Toast the nuts and keep covered at room temperature. Cook and assemble on the day. This recipe was first published in Wed Nov 12 14:44:41 GMT 2014.